Come see my Musical Chair at the Public Art Initiative’s opening Art Exhibit at the New location of The Museum of the San Fernando Valley. The Public Art Initiative (PAI) is a group of artists working and living in the San Fernando Valley that want to bring more public art to the area. This event will be the first time the PAI will host the annual “Chair Show” where over 30 local artists transform everyday chairs into artwork. 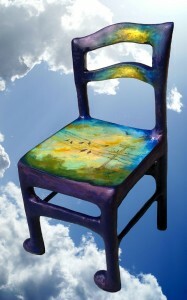 The chairs will be sold during a silent auction. Thanks to the Great Frame Up in Northridge, the PAI is also getting creative with picture frames that will be available for sale and some will be raffled off during the night. If you missed the Northridge Village Art Show, you’ll have a chance to see the artwork and meet the artist at this event. Don’t forget to ask about the series of historical murals that are planned for Reseda Blvd based on this artwork. You can help the PAI fund the next public art project by purchasing chairs, picture frames or artwork during this event. Join us and let’s celebrate art together! If you are an artists interested in participating, please email Roger at publicartsfv@gmail.com for details.